After his 40-year career as a legendary latin-rock guitarist, Carlos Santana is enjoying the fruits of his labor. Literally! In addition to branching out into the areas of fashion (Carlos by Carlos Shoes), perfume, and charity work (Milagro Foundation), Santana has opened a new chain of restaurants. A painter, printmaker, and sculptor from Oaxaca, Mexico, Robles has been exhibited in Mexico, France, Cuba and the United States. An iconic Latina visual artist, Carranza's work has been featured in films and television shows, and ads for companies such as Mitsubishi Motors, Nordstrom, ABC, and many other organizations, as well as magazines and books. Renowned for his mural work in northern California, Rios has also created children's books, billboards, print advertisements, and other commercial art. Creator of Santana's Shaman album cover, Gutierrez is a sought-after artist, by organizations such as Rolling Stone, The NY Times, Verve Records, Arista Records, Sony, Ms. Magazine, Harper Collins, and others. Cover artist for Santana's album Ceremony: Remixes and Rarities, Garcia works in painting, printmaking, sculpture, and woodcarving. Maria Maria restaurants (the name is taken by the song from the Supernatural album) offer Mexican cuisine, but definitely not the "same old" tacos, burritos, and nachos you'll find at other Mexican restaurants. Offering items like seafood guacamole, which includes crab and shrimp, coconut ceviche, soft duck tacos, and mixed wild mushroom fajitas, Maria Maria restaurants have taken traditional mexican cooking and updated it with a modern flair. The chef, Roberto Santibanez, created the menu. A frequent contributor to national food magazines like Bon Appetit and Gourmet, Santibanez worked with Carlos Santana to create a selection of dishes that is at once fresh and reminiscent of mexico's rich culinary history. 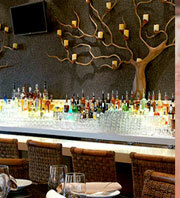 In keeping with the sophisticated, inventive menu, the visual ambience is nothing less than stunning. The artwork, created by a distinguished panel of artists (see sidebar) is complemented by the architecture, furnishings, tableware, and other elements. Every piece of the puzzle has been carefully chosen to integrate into a whole that is really quite striking. And while the food and decor are both obviously upscale, the ambience is a true "California Casual" flavor; you'll feel pampered and comfortable at the same time. Don't go to Maria Maria expecting to hear Oye Como Va blasting from the sound system, or see Santana's Paul Reed Smith guitars hanging on the walls. But you will get an excellent meal in a very pleasant setting. For now, Maria Maria restaurants exist in only four locations. In northern California there is one in Walnut Creek (1407 N. Broadway), and in Mill Valley (651 E. Blithedale Avenue). Outside of California, there is one in Tempe, Arizona (2000 E. Rio Salado Parkway), as well as Austin, Texas (415 Colorado Street). Are more locations planned? Given the success of the first four, the outlook is good. These restaurants were put together by Dudum Sports and Entertainment (the same company that produced celebrity-theme restaurants Bing Crosby's and McCovey's, and Joe DiMaggio's Italian Chop House). Judging by the success of the first locations, Maria Maria restaurants just may become a national phenomenon!